Knowing how to make a great pan sauce for steak is essential for anyone who loves to bring out the rich flavors that steak already has. 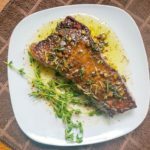 Pan sauce is incredibly easy to make and uses the steak’s natural drippings from searing and cooking and enhances its flavor with other ingredients, like fresh herbs and spices. This simple steak pan sauce recipe is butter-based, so it has just enough creaminess and flavor to bring out the best in your steak without overpowering it. 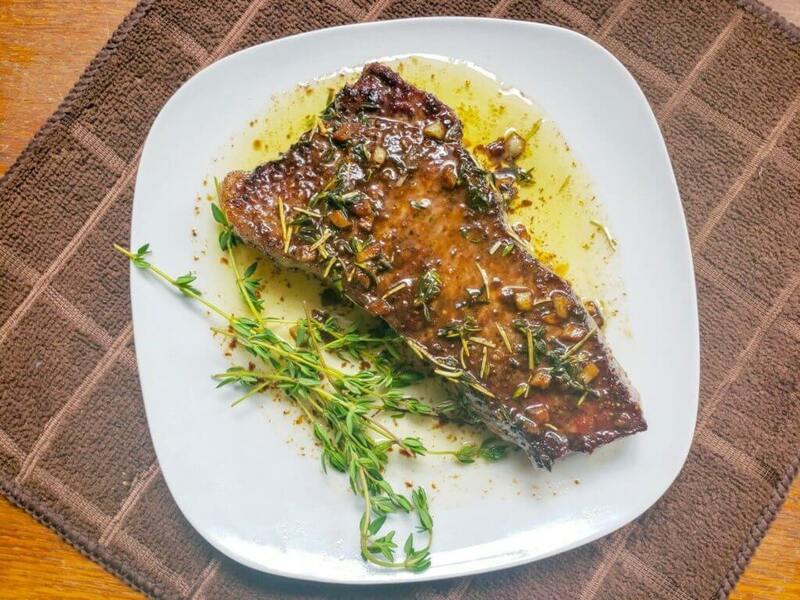 Blended with fresh rosemary, thyme, and garlic for flavoring plus Worcestershire sauce and beef broth for just the right consistency and taste, this pan sauce is likely to become a go-to for no-fuss steak dinners. Allow steak to rest at room temperature for about 30 minutes before cooking. During this time, you can mince garlic and chop thyme and rosemary leaves. Pat steak dry and add salt and pepper to all sides, rubbing them into the steak with your fingers. Preheat a skillet with oil over medium-high heat. Add the steak, cooking for 3-4 minutes on one side until seared with a rich brown crust; flip, and do the same to the other side. For best results, do not overcrowd your pan; instead, cook one or two steaks at a time. Remove the steak from the pan and place on a cutting board. Allow the pan to cool enough until you can comfortably wipe out excess oil with a paper towel, leaving the steak drippings in the pan. Bring the pan back up to medium-high heat and add rosemary, thyme, garlic, and 2 tbsp. of butter. Cook for 3 minutes until fragrant, whisking constantly. Add in broth, Worcestershire sauce, and the rest of the butter and bring to a boil. Turn the heat down to low to allow to simmer. Continue to whisk together for another 3-4 minutes until smooth and thickened. Place steak on a serving plate and drizzle ¼ of the pan sauce over the steak. Serve immediately. This steak pan sauce recipe is one of the easiest you can make, but feel free to get creative. You can throw in some of your other favorite steak seasonings (like our Chicago Steak Seasoning, perhaps?) to experiment with different tastes. 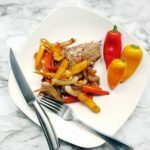 You might also try different ingredients to substitute the broth or Worcestershire sauce to act as the base for the pan sauce. Dijon mustard, red wine, and vegetable broth are other options. Don’t be scared of flavored butter, either! A garlic butter can add extra garlic flavor for those who love its taste, and roasted pepper butter can be a perfectly bold enhancement. Want more steak recipes like this one? We’ve got plenty over at Steak University, your one-stop shop for everything beef.